Complimentary meal for attending our Term Limits Day celebration at Mission Possible Cafe. 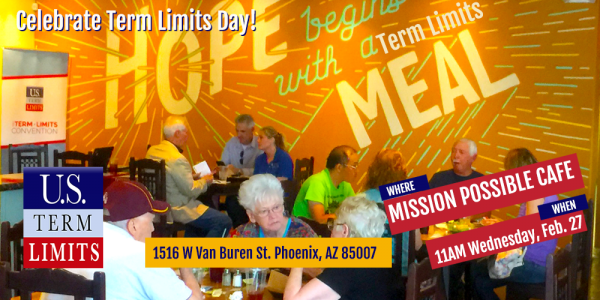 Please be our guests and join us at Mission Possible Cafe for the first ever, national Term Limits Day. Lunch will be available from 11-1pm, with Senate and House cosponsors speaking at noon. Immediately after lunch, we’ll meet over at the legislature for sign waving at 1pm. Happy Term Limits Day, Feb. 27!